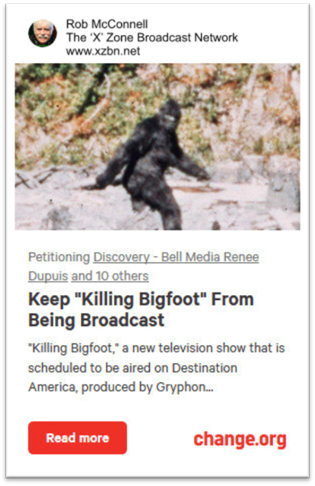 I need your help and the help of as many people that you know to STOP the broadcasting of a US produced TV Show, “KILLING BIGFOOT” that will be airing in the United States and Canada. The six-episode series follows a diverse team of Bigfoot hunters – the Gulf Coast Bigfoot Research Organization (GCBRO). The group’s main mission is to assist families - where local authorities cannot - as they are terrorized by a sleeker, more aggressive type of Bigfoot, while also trying to prove once and for all to the scientific community - by killing a specimen - that the creature does in-fact exist. Help me STOP the Broadcasting of episodes already produced scheduled for broadcast in the United States and in Canada on Discovery, Destination America, Rogers Media, OLN and others. Go to the following link and help me make a difference. The petition will be going to people who have the power to stop the broadcast. From the Prime Minister of Canada, President of Bell Media, Chair of Rogers Media, Chair of the Federal Communications Commission, the Canadian Association of Broadcasters, Executives of Discovery and Discovery Communications and other decision and law makers. For the past 26 years I have been doing my show, writing my newspaper and hosting TV shows as an ethical professional, without the sensationalism that the majority of others abuse to trick and deceive the public into believing that sensationalism is the norm in the paranormal and parapsychology, which it is not. Help me put the reality and common sense back into the investigation back into the investigation of the paranormal and the endeavors of true scientific research of parapsychology. Please, sign my Petition and help me make a difference. If the extraterrestrials are watching and they see what we are doing to unknown or evasive creatures / or unidentified species, what message are we sending to them? How will they see mankind? Will they fear for their own lives - I would have to believe so. "Killing Angels?" "Killing Psychics?" "Killing Extraterrestrials?" "Killing The Loch Ness Monster?" "Killing Mediums?" "Killing of Fairies?" "Killing of Roswell Roads?" ...need I say more? What's next for these TV producers of so called "Reality Shows?" Please pass this email to as many people as you know - we have to make a difference. My God, what type of society have we become where killing animals, people and unknown species? What type of people would want to watch this garbage? What example are we giving our children? What type of world will we leave for them? Thank you for helping me make a difference and hopefully save the lives of our Forest Giants, Bigfoot. For those who do not have a voice, for those who cannot be seen, for those who live with us and alongside us, I thank you.